The World Cup is long gone and this isn’t specifically football related but curiosity got the better of me. I wanted to know why so many Swedish names ended in -qvist. And the answer was quite interesting. Like I did with the Croatian names ending in -ić, I decided to give the Swedish World Cup team a translation makeover. But before all that, we have to find the origins of -qvist. “Kvist” is the most common spelling and it means “twig”. Until the 19th century, most people had surnames named after their fathers and ending with “son”, like Fredriksson. That began to change however and many people took names inspired by nature when they moved to other parts of the country or emigrated. “Kvist” was also a common nom de guerre in the Swedish army in the 18th century, helping it’s popularity. Surnames inspired by nature are very common in Sweden. It is an archaic spelling of the Swedish word meaning “twig” (as in thin, slender tree branch). The modern spelling is “kvist”. This is just one of many nouns taken from nature and combined with other words describing aspects of the natural world in order to create surnames, e.g., Blomkvist (flower-twig); Lundkvist (grove-twig); Hultqvist (forest-twig); Dahlqvist (Valley-twig); Almqvist (Elm-twig); Björkqvist (Birch-twig) or words such as “ny” (new) as in Nyberg; Nyqvist, and “hög” (high) as in Höglund, Högstedt, Högstrand. Strömberg (Stream-mountain); Strömdahl (Stream-valley); Blomberg (Flower-mountain); Almlöf (Elm-leaf); Almgren (Elm-branch); Bergdahl (Mountain-valley); Asplund (Aspen-grove); Bäckström (Brook-stream); Ekelöf (Oak-leaf); Lönnroth (Maple-root); Lindencrona (Linden-crown). An interesting feature of this category of Swedish surnames is that they tend to preserve archaic spellings of certain words, e.g., “löf” / löv (leaf); “roth”/ rot (root); crona/krona (crown); dahl/dal (valley) and qvist /kvist (twig). Very interesting indeed. 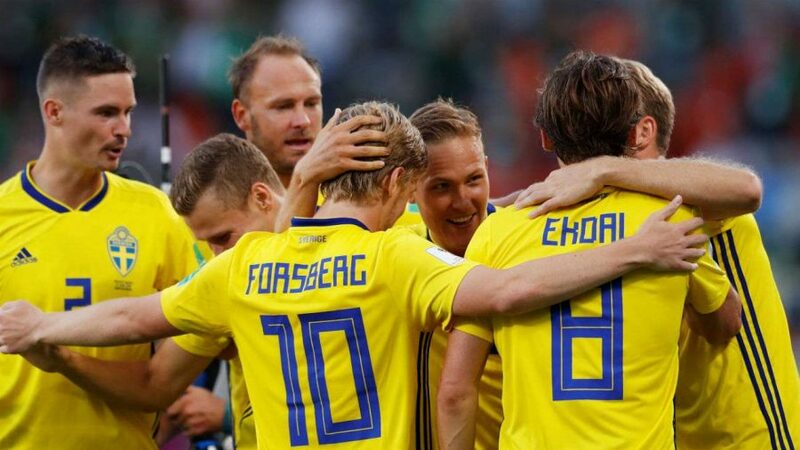 So what would that do to Sweden’s starting line up against England in the 2018 World Cup Quarter finals? Not much. Why? Because only one name ended in -qvist, and that was Granqvist, which translates as “spruce branch”. But we do have a few suffixes. And (Mikael) Lustig = “funny”. So I guess ex-Man United and Everton cult left winger (Jesper) Blomqvist‘s surname means “flower branch”. Fascinating.